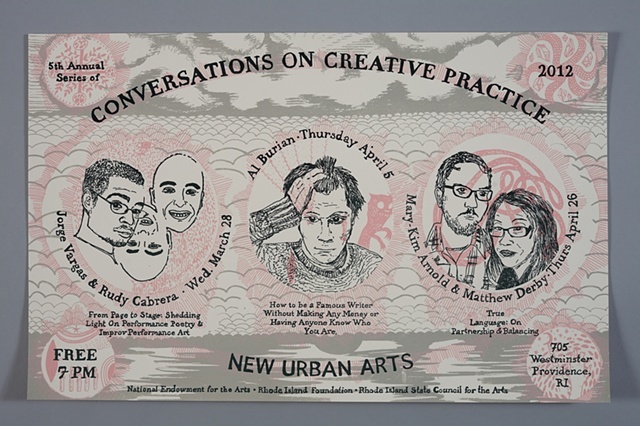 I co-curated these Conversations on Creative Practice at New Urban Arts with a team of other awesome people. These conversations were public forums to explore how individuals integrate creativity into their personal and professional lives. For the 2012 poster, I collaborated with alumni students and mentors to design and print the poster. Julia Gualtieri, Caitlin Cali and Priscilla Carrion and Lois Harada all contributed to this silkscreen and letterpressed poster.